As of this reading on Dec. 10, 2017, President Donald Trump's job approval rating in the Real Clear Politics average of polls has dropped to 37.4% which equals the low point of his presidency that he had on August 14. What may be even worse news for the president is his disapproval rating has reached the highest number of his presidency to date at 57.8%. 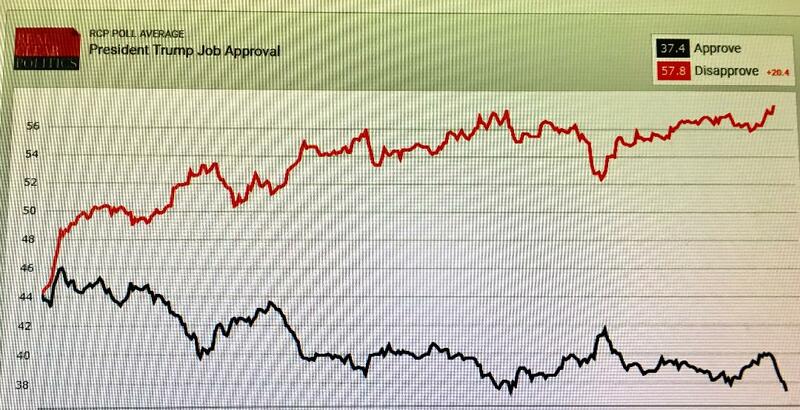 This gives him a negative 20.4% rating which tops the previous low of his presidency of 20% that he had on August 14. What is incredible, only on the first polling day recorded in the RCP averages of his presidency on Jan. 27, 2017, did president Trump have a positive approval rating...and that was only 0.1% positive, when he was 44.3% approval to 44.2% disapproval. His highest approval rating occurred on Feb. 4, 2017 at 46%. It has almost been a steady decline since that time. President Trump in his speeches likes to exaggerate all the time that what he has accomplished as being the first time of any president in history [and then he will add, "well maybe since honest Abe"]; well I am almost certain president Trump has accomplished a real first of any president in history: The first time a president has not even come close to a 50% approval rating in their first year in office. 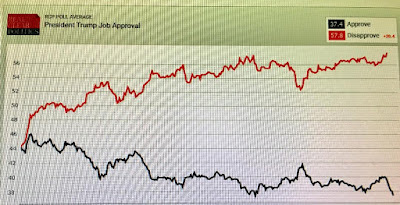 With recent very good economic numbers and a stock market at near record highs you would actually think the president would have higher approval ratings. I am just speculating here, but could one factor in reaching this all time low be to his going all in on backing an accused stalker of teenage girls for the United States Senate? That is just speculation on my part, but I bet it doesn't help his numbers. If the economy [usually a driver in the president's job approval numbers] hasn't gotten the president's approval in positive territory in his first year in office, you have to wonder what will in these next 3 years of his first term. Thanks again to the best web site to go to for polling averages and one of the best sites for political news and opinions, Real Clear Politics.